Do you need something of sustenance to get you going on these chilly fall mornings? By George, I think I found the next best thing to wool socks. In Annie’s test kitchen this weekend, I ventured beyond my comfort zone. Rather than use the week-old ripe bananas for my favorite cocoa banana bread, http://blog.bilowzassociates.com/2010/04/going-bananas-over-bread.html I discovered a new recipe in my tried and true baking book. It may have been the maple syrup and oats that caught my eye. And in Annie fashion, dried fruits were added to give it an extra boost. Nuts could provide a bonus crunch, making this bread taste like granola cereal instead of just your ho-hum banana-rama treat! Add a cream cheese smear to a warm slice and you might work all day in the garden without realizing you just had a doorstop special. This is for all my gardening friends who want to swap out garden tools for kitchen utensils on these chilly days when baking is just as fun as gardening. And if I can bake it, you know it is a doable recipe. One note of caution – I am always adding Annie extras, even when I bake, which is usually a no-no in a baker’s kitchen. So give this bread additional time in the oven if you add the extra tidbits. It is worth it! Not too sweet; perfect with your early morning cup of Joe! So before we get to the guts of the recipe, we need a Bob Monkhouse quote to get us in the cooking mood. 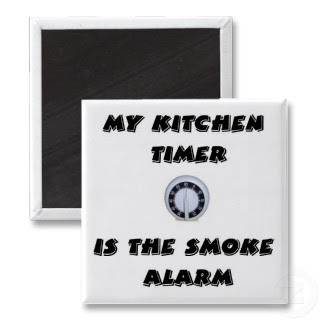 “I'm not saying my wife's a bad cook, but she uses a smoke alarm as a timer.” So let’s test your smoke alarm and get baking. Preheat over to 350 degrees. In large bowl, combine flour, oats, brown sugar, baking powder, baking soda, ½ teaspoon cinnamon and salt. In small bowl, combine eggs, bananas, ½ cup pure maple syrup and oil. This is where you can add extra tidbits. I added dried apricots and dates chopped into bite size pieces. Stir these ingredients into the flour mixture just until moistened. You can add your nuts here or put them on top of the bread before placing in the oven for extra crunchy. Turn into greased 9 X 5 inch loaf pan. Bake 45 to 50 minutes or until wooden toothpick inserted near center comes out clean. Cool ten minutes before removing from pan. Brush top with remaining 2 tablespoons pure maple syrup. Combine granulated sugar and remaining 1/8 teaspoon cinnamon; sprinkle over top. (Recommended – get a tiny shaker jar with cinnamon and sugar blended together and you can add to everything, including your coffee. Enjoy this rainy, windy Monday and always save your ripe bananas for these tasty treats!